If you need more convincing about what scope to buy, remember that Swarovski Optik's is an Austrian family-owned company steeped in the tradition of producing superlative binoculars and telescopes. Their products are often icons of both optics and aesthetics, with the posh spotting scopes being hallmarks of the distinguished brand. 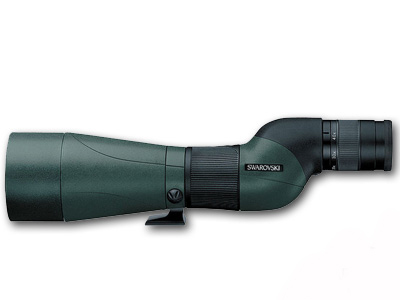 The STS-80 20-60x80mm HD Spotting Scope with Eyepiece (Straight Viewing) from Swarovski is a rugged yet refined scope from one of the world's most renowned optics manufacturers. The STS series combines the unmatched image quality and world-class workmanship that nature enthusiasts, tactical professionals, and researchers have come to expect from Swarovski. The 80mm configuration is robust yet relatively lightweight, and superbly-matched for the needs of long-range hunters and birdwatchers. Swarovski's proprietary SwaroVision technologies redefine the standard for optical excellence. Fluoride-containing HD elements are the core of the STS series spotting scope. These premium-glass elements efficiently transmit all wavelengths of visible light, resulting in bright images that are colour-faithful, crisp, and rich with detail. SWARODUR and SWAROTOP coatings on all lenses and prisms minimize glare while maximizing contrast. Phase-corrected prisms ensure that images are rendered with unsurpassed clarity. Perfecting the optical path is a SwaroVision field flattener lens that eliminates geometric optical distortion throughout the zoom range. Field flattener lenses reduce barrel and pincushion artifacts common in wide angle and telephoto optics while preserving clarity and sharpness along the edges of the field of view. Optional digiscoping accessories from Swarovski allow operators to transform their STS spotting scope into a formidable digital imaging platform. These accessory adapters enable integration with point-and-shoot, mirrorless, and DSLR camera systems, and feature the build-quality and thoughtful engineering you expect from Swarovski. Now your superior optics can be used to capture high-definition stills and video of that rare bird or butterfly in your sight. A removable sighting aid acts as an auxiliary scope for easy target acquisition while a camera is mounted to the eyepiece. Ergonomic handling and user-friendly functionality package the STS premium optics into a full-featured glassing system. An included 20-60x eyepiece features a wide viewing angle and generous eye relief, making the STS an observer's delight and nothing less than you expect from Swarovski. The eyepiece quickly attaches/detaches from the objective assembly's bayonet mount for easy disassembly, transportation, and storage. The nitrogen purged, o-ring sealed, and rubber armoured housing ensure waterproof, fogproof, and shockproof performance in almost any environment. Whether you are in the wild, on the battlefield, or at the range, the STS spotting scope is engineered to deliver world-class performance in extreme conditions for years to come.